WHITNEY, Texas - About 40 or 50 miles northwest of Waco, out in the middle of nowhere by some standards, sits one of the prettiest lakes in Texas. At least, that's what the fishermen will tell you when they're hauling in some of the best white and striped bass in the state. On the southeast side of that lake, golfers might tell you the same thing when they're playing White Bluff Resort. 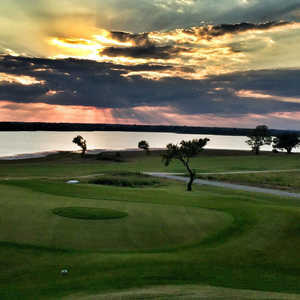 Home of two 18-hole championship courses, White Bluff, especially the Old course, offers some of the prettiest views of the above-mentioned lake. Even if you're not playing particularly well, you'll appreciate the vistas from some of the elevated tees and greens. "It's just so peaceful out here," said General Manager Fred Molsen, who came on board a couple years ago for Double Diamond Companies to manage the 3,450-acre resort and community. "My favorite time to play out here is in the late afternoon. That's when you see all the deer out here and get the great sunsets." 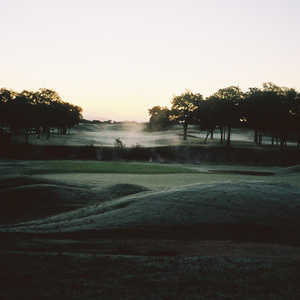 Semi-private White Bluff offers two distinctively different 18-hole courses designed by Texas resident Bruce Lietzke. The Old course, which opened in 1993, features plenty of oak-lined fairways and a back nine that backs up to Lake Whitney, offering some of the best views anywhere. The New Course, the back nine of which was completed in 1997, is the more difficult of the two. Water comes into play on what seems like every hole, its bentgrass greens are more undulating and smaller than on the Old Course and the fairways are tighter. Perhaps that's why the Northern Texas PGA Section chose the New Course to host the Texas State Open from 2003-2006. Of course, for those players, it didn't seem too difficult. This summer, journeyman tour pro Kelly Grunewald won his second Texas State Open title with a 72-hole total of 262 (22 under par). He joined Lee Trevino and a two other players as the only two-time winners of the event, winning $22,500 for his efforts. You might not shoot 5 under par or better there for 18 holes, but you'll have plenty of fun - if you manage your game a little. "Even from the back tees, at almost 7,000 yards, the course really doesn't play that long," Head Professional Pete Glass said. "The key is to get it in the fairway." That sounds like advice you would hear most anywhere, but it's particularly germane to the New Course. From the get-go on the first hole, a creek and trees line the entire left side and there's OB right. So a straight shot on the 413-yard par 4 is critical if you want to find the green. Club selection on the next hole, a short par 4 is even more critical,or you'll hit it through the sharp dogleg right, and the theme continues. (No. 2 has to be one of Lietzke's favorites, although in fairness, he sprinkled both courses with plenty of right-to-left holes.) That's not to say you can't hit any drivers; you'll just want to pick your spots. The signature hole is the 396-yard par-4 12th . Good players won't hit more than a fairway wood or long iron off the tee because water looms around 280 yards off the tee. There, players are faced with an approach over water to a green guarded by cliffs and trees to the left and a bunker behind the green. It's not difficult, but it sure is pretty. The par 3s on the New Course are particularly difficult with the third and 15th playing longer than 200 yards. The 15th is more than 200 yards from three sets of tees and features a water hazard all along the left side. For many, the Old Course, especially with some recent updates, is perhaps a little more enjoyable. White Bluff has spent the past couple of years improving conditions on that course, including the renovation of several greens and bunkers and the addition of 19 new bunkers to better frame holes and greens. There are plans to add a lake on the left side of the fairway on the now wide-open par-5 third over the next year and a half, Molsen said. The Old Course, a par 72 at 6,866 yards, is really a tale of two nines. The front nine, while no pushover, is the easier of the two and also more vanilla. The back nine, which pushes through elevation changes overlooking the lake, requires more precision. Nowhere is that more apparent than the 382-yard par-4 14th , which is the course's No. 1 handicap hole. The tee shot is critical on this dogleg left. Most good players will probably hit a 3-wood or long iron to get it into the bend for a straight shot to a small green that's protected in the front and to the right by a creek as well as two bunkers. Survive the 14th and you'll have plenty of fun on the back nine. The 13th is a picturesque 158-yard par 3. 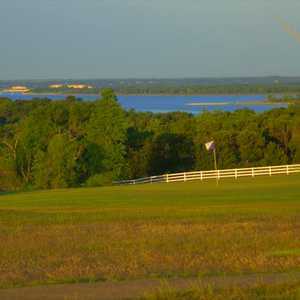 From the tee, if you look back, you can see the marina on the lake and much of the property at White Bluff Resort. To quote Monty Python, this is "something completely different." It isn't the Four Seasons, but it isn't second-rate either; it's just more relaxed. There are plenty of deer, foxes and raccoons to commune with, plus if you like to fish or boat, there's that, too. The golf courses aren't overly spectacular, but they're in good shape and they aren't boring. The green fees are in the $40-$80 range, which is fair market value. A package deal - which can start as low as $120 per player and includes golf on two courses, cart and overnight lodging - is recommended as there isn't much in nearby Whitney both in terms of hotels or dining. Guests of White Bluff Resort have several choices of accommodations. The Inn, which backs up to the shores of Lake Whitney, offers 47 well-appointed rooms in a rustic setting. Popular among golf groups are the one-bedroom and two-bedroom condos and log cabins located along the Old Course. All are equipped with a kitchen and an outside grill. Rates range from $110 per night at the Inn to $330 a night for the larger cabins. For reservations, call (800) 335-0955. New for this year is a first-class full-service spa and fitness facility. Featuring five private treatment rooms, guests of the resort can be treated to everything from manicures and facials to deep tissue massages. In addition, the fitness room overlooks the lake, which makes the drudgery of running on a treadmill a little more palatable. Call (254) 694-0301 for spa appointments. Overlooking Lake Whitney, the Lighthouse Restaurant offers an exotic menu, featuring such entrees as pepper-crusted tenderloin medallions, molasses seared sea scallop, crawfish and lobster cavatappi, mango chipotle grilled quail, Harissa-sorghum cured pork chops or pan-fried cornmeal-dusted trout. It's a bit pricy, as all gourmet fare is, but even if you don't play golf, eating at the Lighthouse Restaurant is worth the trip. Call (254) 694-0305 for reservations. On the lighter side, you can get breakfast tacos, hot wings, a great burger or quesadillas at the Trophy Grille at the New Course. Call (254) 694-0306. Lake Whitney, which was finished in 1954, is fed by the Brazos and Nolan rivers. It covers nearly 30,000 acres and is 67 feet in its deepest location. THE INN AT WHITE BLUFF RECENTLY BURNED DOWN DUE TO AN ELECTRICAL FIRE, SO THE CLOSEST PLACE TO STAY NOW WOULD BE JUST NORTH IN CLEBURNE, OR EAST IN HILLSBORO. ALSO THE LAKE IS ACTUALLY 100' TO 110' DEEP AT ITS DEEPEST!